Posted on: December 11th, 2017	by Jennifer A. 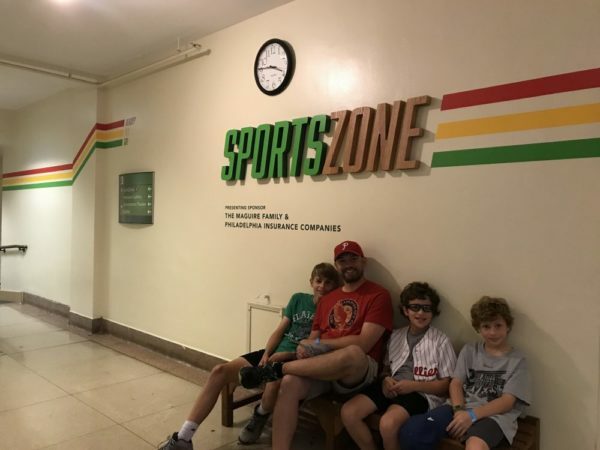 We were provided with tickets to The Franklin Insitute in Philadelphia to make this article about the Franklin Institute SportsZone possible. Have kids who like to run, jump, bike and move? I do too. 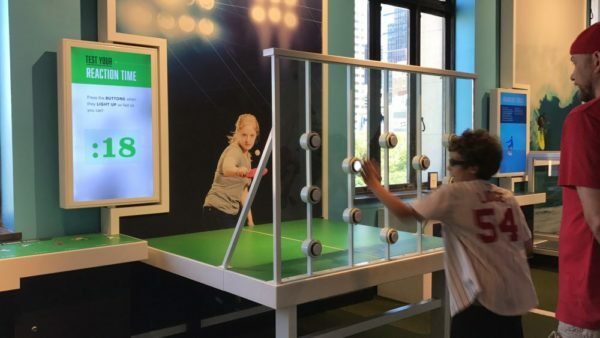 The Franklin Institute SportZone is a must-see exhibit area for us everytime we visit Philadelphia. Even with all the museum has to offer, we don’t leave without a visit to this area. 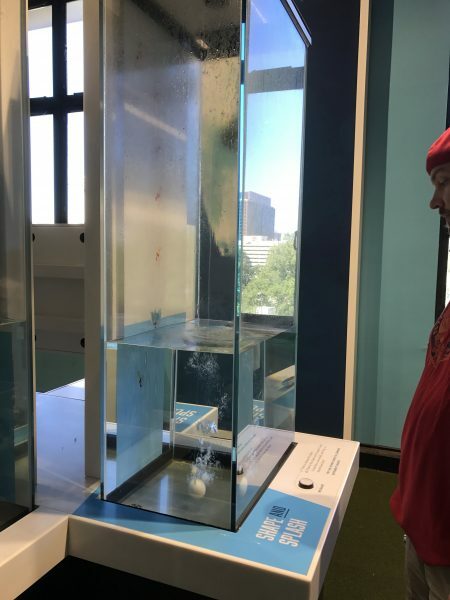 It’s a fun interactive area that lets my boys burn off some extra energy while also learning about how science affects the way their bodies move. Every athlete needs to stay hydrated and nourished to be in optimal condition for sports. This includes my own boys who have practices multiple times a week and games on weekends. 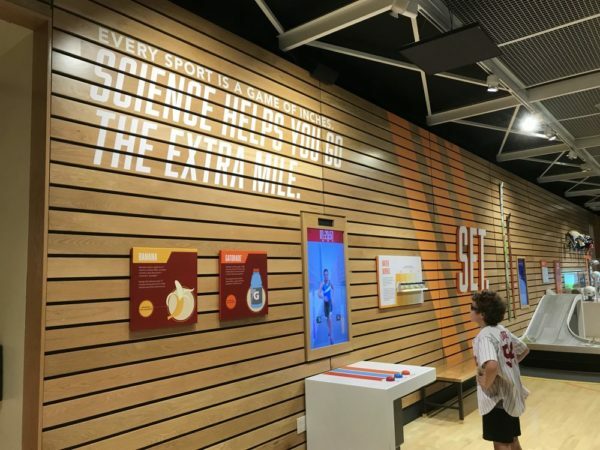 In the SportZone are several stations that discuss nutrition like how many calories you need based on your activity level and hydration exploring the best fluids to drink before, during, and after exercise. What’s tilt got to do with it? My boys have just started learning to ski. This was our second winter of lessons, so this Franklin Institute SportZone area was very relevant. 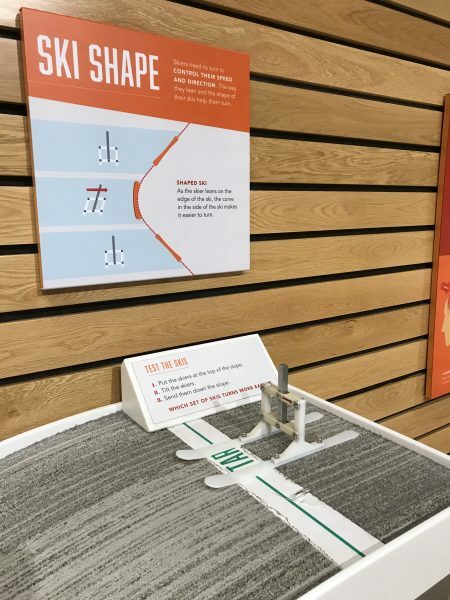 With plastic models of skis and a model of a hill, my boys could test how different ski shapes, and the tilt of skis affect a skier’s ability to get down the hill. Gear to Gear, Which is better? Low gears and high gears each have their advantage when it comes to biking, especially biking on hills. 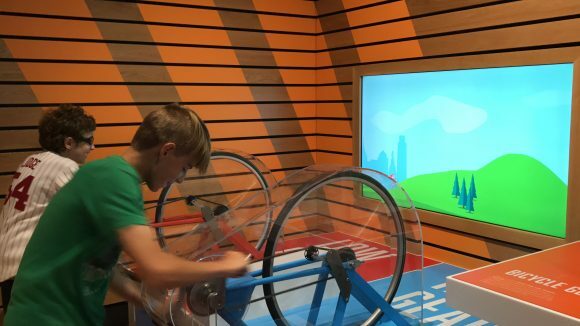 In this Franklin Institute interactive area, my boys went head to head in a hilly race. One son hand operates a wheel with a low gear, while the other cycles the high gear. As my boys raced they were also observing on screen through images and explanations the mechanical advantage of those gears in bicycle design. Want to test how your pitch compares with experts? My boys did and got answers. In the baseball pitch booth, they got a few practice pitches before the cameras turned on. Once the high-speed cameras are on they record every move. Afterwards, they got to watch an instant replay showing them how they compared to a pitcher. It’s a great way for aspiring baseball players to analyze and improve their pitching technique and learn about body mechanics. For my baseball playing sons, they loved this. Decide who to race against! 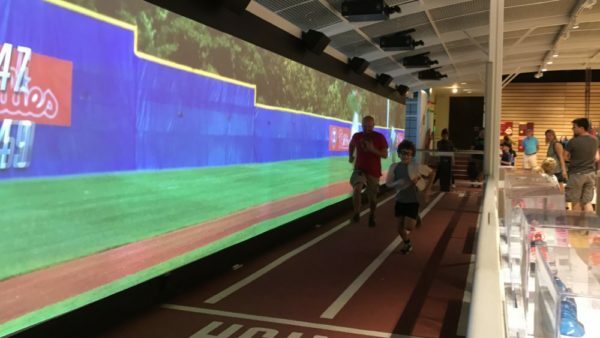 In the Franklin Institute SportsZone, not only can you race against a friend or family member, but you can also virtually race against a professional athlete or mascot. When my boys stepped up to the computer they took a look at who their potential competitors were. They could choose from the Philly Fanatic, Jordan Matthews Philadelphia Eagles wide receiver, Dawn Grunnagle Marathon Runner, Richard Browne sprinter, Tatyana McFadden wheelchair racer, and Brian Talley inline speed skater. They did a few races against both our beloved mascot and Jordan Matthews. When the buzzard rings, all the racers take off. You can follow their progress on the wall. At the end of the 40-foot race, the wall displayed each of their times so the winning boy or dad knew just how far or close the race really was. 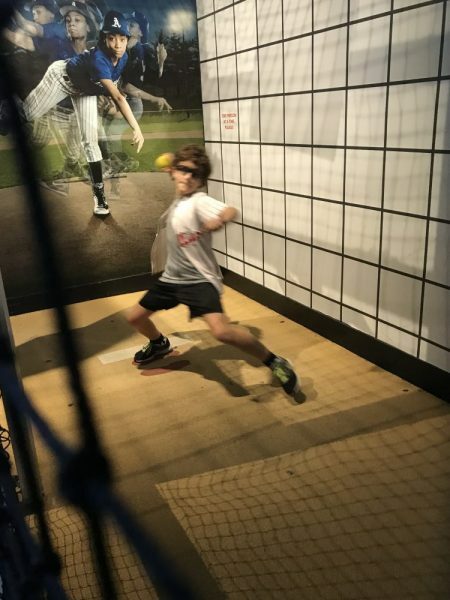 This is one of my boys’ favorite parts of the interactive sports exhibit at the Franklin Institute. They won their races against the Fanatic but didn’t do so well compared to Matthews. 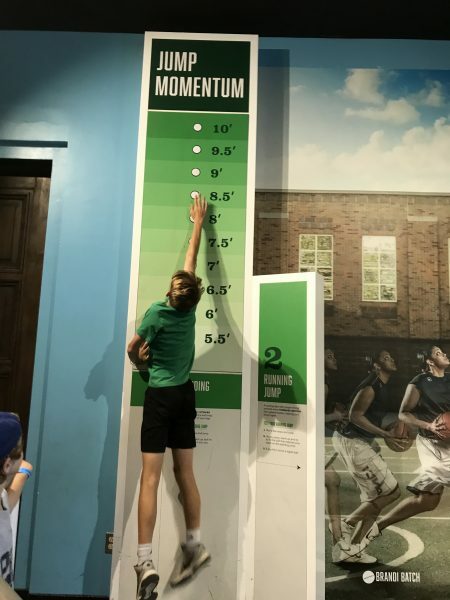 With the standing jump station in the Franklin Institute SportsZone, my boys measured their jump momentum by standing and jumping up. The goal is to hit the highest button you can to record your jump momentum. As you can see my almost-teenager son didn’t do too bad. After trying the standing jump, the boys took turns with the running jump in the SportsZone. 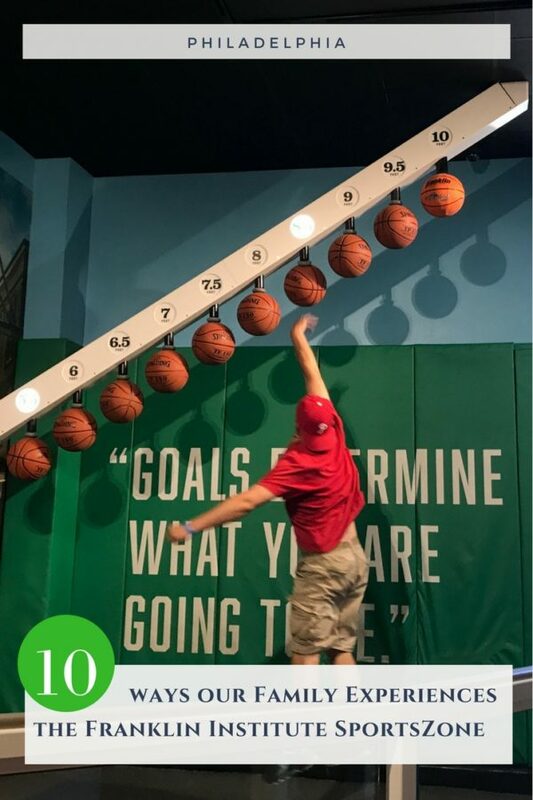 From one end you take a running start towards an array of basketballs and see how high of a basketball you can reach. 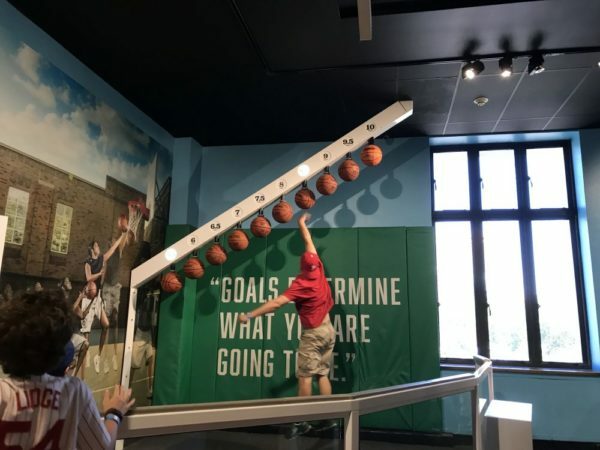 The basketballs range in height from 5’ to 11’. Despite my boys trying multiples times to reach a higher height, none of them could compare with my husband’s jump. Of course, the way my boys are growing that might soon change. You don’t need your swimsuit here. And you don’t need to worry about getting wet! 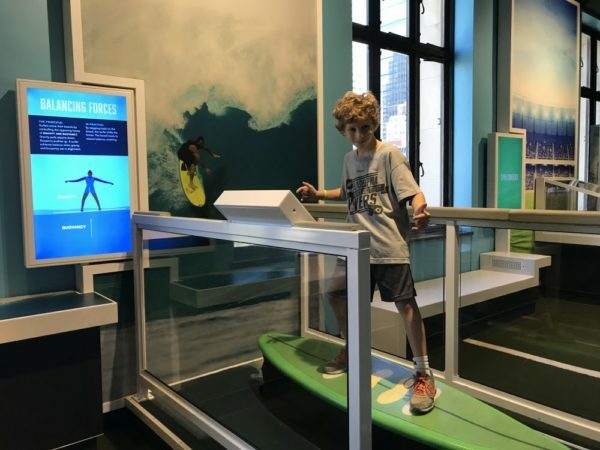 At the Franklin Institute SportsZone, my boys and I took turns riding the simulated waves from this computerized surfboard. It’s a great activity that allowed them to test how different forces affect their balance and how to shift the center of their body mass to accommodate that. With 4 water tanks to choose from we were able to splish, splash, and splunk to determine how an object’s shape causes it to splash when dropped through the water. As my kids tested out each tank and shape I quickly snapped pictures to catch the moment of impact between the object and the water. See below, how even though the sphere is near the bottom of the tank you can still see the ripple of the splash from the moment of impact. It happens so quick when you watch it, but with pictures you can see the action frame by frame. Divers use information like this to adjust their own bodies and minimize the splash they make when entering the water. You can’t walk by this wall of blinking lights and not be tempted to try it out. Once we pressed start, we had 30 seconds to test our reaction. We each took a turn. The buttons started lightening up and we each had to quickly slap them before the next button lit up. It’s harder than it looks. In the end, the results showed us how accurate we were with the number of hits and what our average response time was. The display encouraged us to try again, reminding us that all great athletes practice. Turns out even though my husband is the oldest in the family, he had the quickest reaction time. 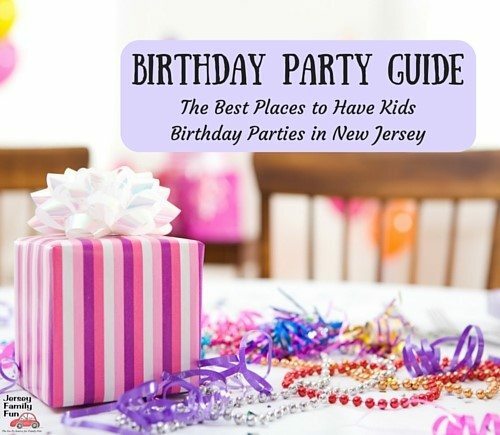 Planning a visit to Philadelphia? I also have this article about the Philadelphia Zoo, .13 Secrets to an Amazing Adventure at the Philadelphia Zoo. We also have these additional articles about The Franklin Institute. 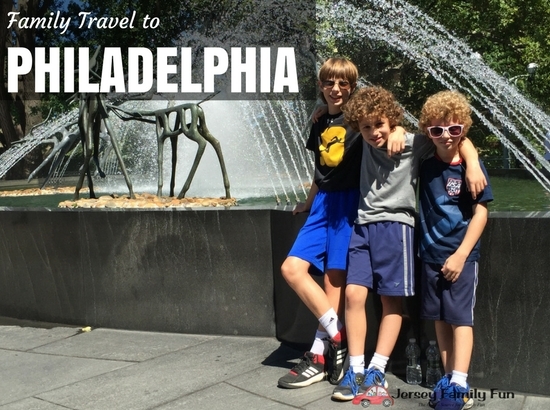 Click over to see the rest of our Family Travel to Philadelphia series. Thanks you for your details and information.